Day 23: Still going strong! I’m not surprised that I’ve made it this far… but yeah, I’m kind of surprised that I made it this far. Day 25: A bunch of my coworkers went down to Klyde Warren Park at lunch today to go to the food trucks… I opted to stay inside and eat the lunch I brought with me, knowing there would be zero things I could have in the park. So sad. Day 26: I’m going on a camping trip with my college girlfriends in a few weeks and I’m hoping that eating all the food we bring doesn’t give me a headache or make me feel sick while out at the lake! Maybe I’ll try to bring something healthy like carrots, or chicken, or rice krispie treats… oh wait…. Day 27: I watched the documentary Fat, Sick, and Nearly Dead and now I feel like I need to buy a juicer! I wouldn’t want to have only juice fore very meal, but there are so many juicing options! And the nutrients! Day 28: I think I fell asleep within 5 minutes last night. That was amazing. That is a great perk from this process! Day 29: I already have a day planned at the end of the week to go to lunch with some coworkers. It will be nice to have a little more freedom of choice and be able to eat something that I didn’t cook myself! Hopefully we go somewhere with healthier options! Day 30: I made it- and I didn’t cheat once! (At least not that I know of!) Now I’m looking forward to trying some of the ‘old’ foods again and seeing how I react to them. First up, peanut butter! Oooh that better go well or I will be Up.Set. 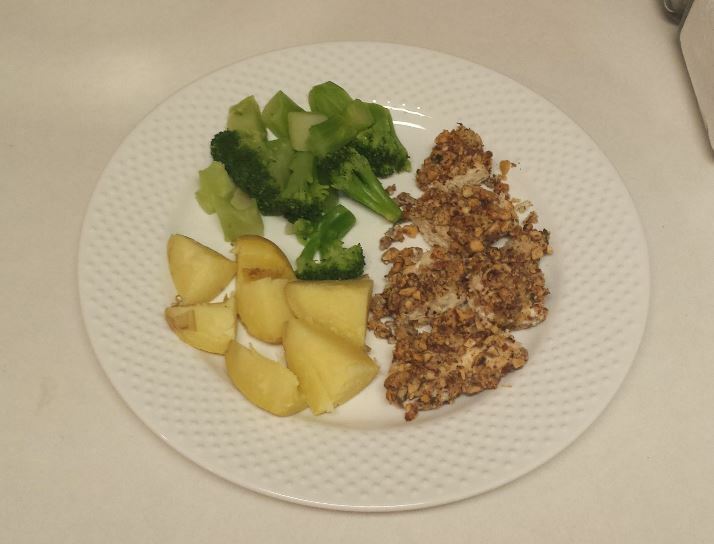 Favorite meal of the week: Almond crusted chicken, steamed veggies, and a little golden potato! This is by far my favorite meal that I’ve had this whole time. It was obviously because of the addition of the potato. For sure. I feel pretty darn good, but… I honestly don’t feel that much different than I did before I started this thing. Maybe because people go crazy talking about the Whole30 I expected to feel some super magical transformation? I don’t really know. I’d say that the main difference is that I sleep better and fall asleep much faster. That is well worth it to me! So… will I ever do it again? Sure, why not?!? I don’t think I’ll do it in like…. July… but maybe in a few months or next year I’ll give it another go and do this whole crazy thing again! Have you reintroduced pb yet? ?